Travelers should carefully consider personal health needs when traveling abroad, especially when they will be immersed in an unfamiliar culture and away from their everyday support systems. These resources can assist travelers in making informed pre-departure plans, mitigating risks, and taking ownership of their wellness. Students from all U-M campuses who travel abroad on University of Michigan Related Travel (UMRT) must have U-M Travel Abroad Health Insurance. UMRT may include (but is not limited to) study, research, internships, service, conferences, presentations, teaching, performances or athletic competitions. Student insurance is managed by Worldwide GeoBlue (Educational Plan). Students may purchase travel abroad health insurance individually, but can also check with their advisor to see whether their program or department is purchasing the insurance on their behalf. Faculty and staff traveling internationally for UMRT are covered under the University’s blanket travel abroad health insurance policy with Worldwide GeoBlue (Business Plan). For international personal/leisure travel, all students, faculty and staff can individually purchase Worldwide GeoBlue (Leisure Plan). Find full information about HTH Worldwide/GeoBlue coverage benefits and enrollment instructions on the U-M Travel Abroad Health Insurance site, managed by University Health Service. U-M Travel Health Preparation Guide: This tool helps students identify and plan for health care needs during international travel. Travelers are encouraged to answer the questions in the guide and consult with a health care provider, UHS, and / or CAPS where appropriate. 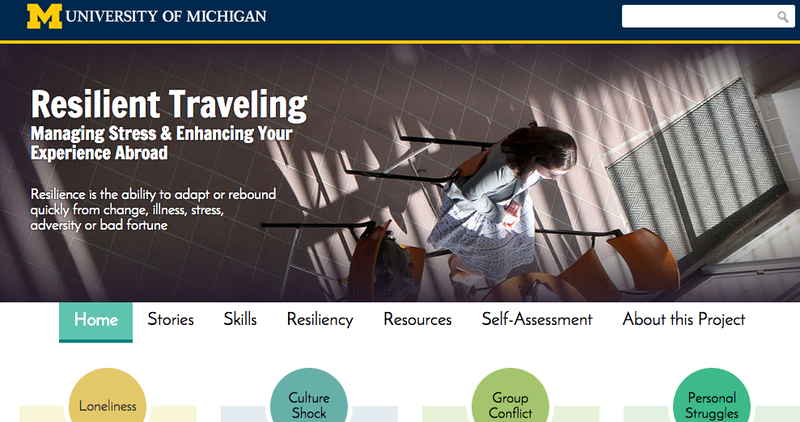 Counseling and Psychological Services: Before departure, U-M students are encouraged to visit their counselor or campus’ Counseling and Psychological Services (Ann Arbor, Dearborn, and Flint) to discuss strategies to reduce the impact of culture shock and to manage mental health needs abroad and after returning to the United States. Faculty and Staff Assistance Program: Faculty and staff may receive counseling services from the Faculty and Staff Assistance Program (FASAP). UHS Travel Health Service: All travelers are encouraged to make appointments with their primary care physicians or University Health Service (UHS) for a physical before departure. UHS can also provide immunizations, prescriptions, and advice tailored to specific destinations and health conditions. UHS Travel Health Education Program: Travelers can explore the Travel Health Education Program to learn about health self-care and preventative strategies for travelers diarrhea, malaria, and more. UMHS Overseas Travel Clinic: The University of Michigan Health System (UMHS) Overseas Travel Clinic is available by appointment for individuals who need immunizations or health advice before travel. International travelers may encounter challenges that vary by academic discipline, level of education, local context and the nature of on-site activities. Resilient Travel – Managing Stress and Enhancing your Experience Abroad is a unique U-M web resource that helps travelers think proactively about personal challenges and build skills to successfully cope with difficult situations. The Resilient Traveling toolkit includes common problems, videos of authentic student stories, practice exercises and a confidential self- assessment that provides recommendations for support resources and coping strategies. CDC Advice for Students: Prepare for a safe and healthy study abroad experience by following CDC’s travel health tips for students. CDC Travelers’ Health: Travelers are encouraged to visit the CDC’s Traveler’s Health website to research the suggested vaccinations for their travel destination/s.